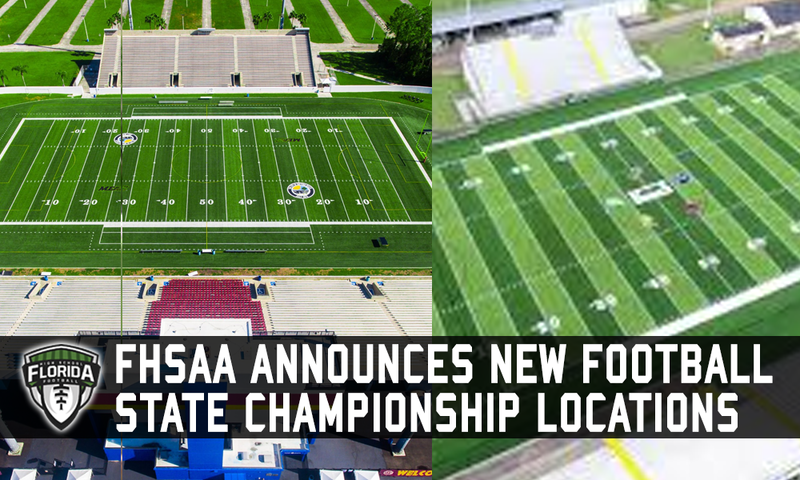 GAINESVILLE, Fla. — For the first time in over 13 years, the FHSAA football state championships will have a new home — in fact two new homes starting this fall. In a press release on Friday afternoon, the FHSAA announced that Daytona Beach and Tallahassee will split the hosting duties for the games for 2019, 2020 and 2021 seasons. Tallahassee will host the Class 1A through Class 3A state championship games on December 5, 6 and 7 of this year. Daytona Beach will host the Class 4A through Class 8A state championship games on December 11, 12, 13 and 14 of this year. Classes 4A through 8A will have a week off prior to their respective state championship games being played. With the changes, the two new venues will allow for seven of the eight state championship games to be played under the lights, something that only three or four of the eight state championship games have been able to experience in the 13 years the game was hosted in Orlando. And there was a lot of reasoning for the move. Both Daytona Stadium and Gene Cox Stadium have undergone significant renovations within the last year. According to the FHSAA, Daytona Stadium has seen a $20 million dollar renovation including new field turf, remodeled locker rooms, an open-air VIP club, VIP space with theater seating and a completely redesigned expansive concourse area. Gene Cox Stadium has seen $800,000 in renovations that include a new field turf playing surface and HD video boards. However, this will not be the first time either facility has played host to FHSAA state championships in football. Daytona Stadium, then known as Daytona Beach Municipal Stadium, hosted all the FHSAA football state championships in 1989 and 1990 and then again from 1993 through 1996. Gene Cox Stadium, then known as Capitol Stadium, hosted the 1986 Class 3A state championship game between Godby and Clewiston. Current seating capacities at both Daytona Stadium and Gene Cox Stadium are 10,000 and 6,500 respectively. In the end, the communities and the experiences they will provide will also be an added benefit for the state championship games. “We are excited about our new partnership with both Tallahassee and Daytona. We feel strongly both communities and venues will provide the very best experience for student-athletes across the state.” FHSAA Football Administrator Frank Beasley said.